For those who suffer from gluten intolerance or are among the estimated 3 million Americans suffering from celiac disease – or preparing food for someone afflicted with this chronic illness – there is a new tool that will make food shopping easier. In August 2013, FDA announced a regulation that defines and standardizes the term “gluten-free” for food labeling. The new definition ensures that gluten-free claims on products are consistent and standardized across the food industry. Why “Gluten-Free” Labeling is Important: Gluten is a protein found naturally in wheat, rye, barley, and crossbreeds of these grains. It gives breads and other grain products their shape, strength, and texture. 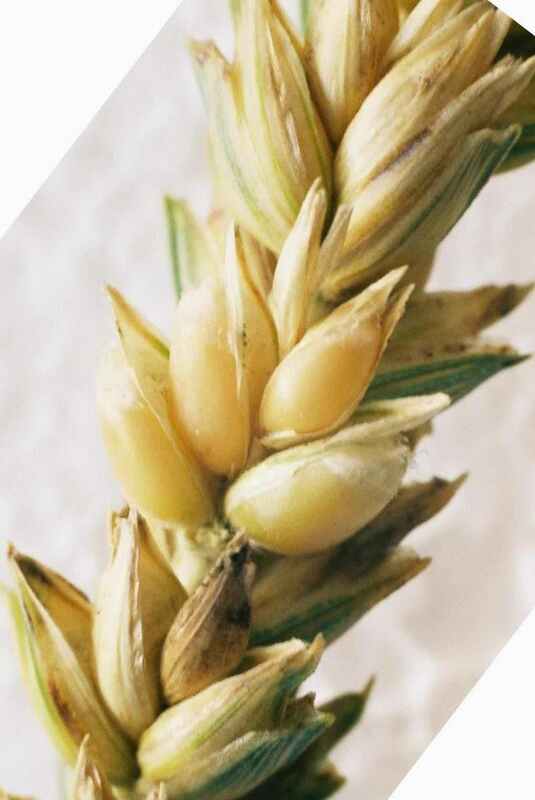 But when someone with celiac disease consumes gluten, his/her body’s natural defense system triggers antibodies that attack and damage the lining of the small intestine. This limits the ability to absorb nutrients, and can lead to other very serious health problems, too. Timing for Label Compliance: Many foods that were labeled as “gluten-free” prior to the new regulation may already meet the new federal definition. Otherwise, manufacturers have until August of 2014 to make whatever changes are needed in the formulation or labeling of their foods bearing a gluten-free claim in order to legally market them in the United States. Door Type dish machines are the most popular style dish machine sold on the market and are used by a wide variety of food service establishments. Door type dish machines are available in two styles, including chemical or low temp dish machines, and high temp dish machines. The National Sanitation Foundation (NSF) approves both types for the commercial foodservice industry and provides specific standards for temperature ranges and chemical solutions to ensure the proper cleaning and sanitation of pots, pans, and utensils. Let’s take a deeper dive into both types of dish machines and review their standard features and tips for purchasing a pass through machine for your establishment. Low temp chemical door type dish machines utilize three types of chemicals that are dispersed via three separate chemical pumps. These chemicals include a liquid detergent for the wash cycle, a rinse aid for spots, and a sanitizing chemical for final sanitation. Low temp chemical machines require an incoming water temperature of 120 to 140 degrees for each of the cycles. While the chemical pumps will arrive from the factory pre-set for the correct amount of chemical solution for each cycle, they can be field adjusted as needed. Cycle times for low-temp chemical dish machines average 60 to 90 seconds per cycle and can run 37 to 60 dish racks per hour. Low temp chemical dish machines are ideal for leased locations that have limited access or prohibit you from installing an exhaust system and condensate hood. 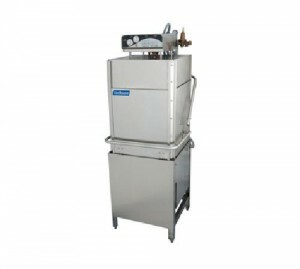 High Temp dish machines also utilize a liquid detergent and a rinse aid. However, they use a high temperature for sanitation in the final cycle, unlike the low temp machines which use a sanitizing chemical. Cycle times for high temp machines average 58 seconds per cycle and can accommodate up to 60 dish racks per hour. High temp door type dish machines feature a built in booster heater and tank that raises incoming water temperatures to 180 degrees during the final rinse cycle to achieve proper sanitation. Boosters are available in either a 40 or 70 degrees. It’s important to specify the booster size when you’re purchasing a dish machines as 40 degree boosters require an incoming water temperature of 140 degrees, while 70 degree boosters only require an incoming water temperature of 110 degrees to reach the final required rinse temperature. Keep in mind that high temp dish machines do not come with chemical pumps, so you’ll need to contact a chemical company to provide the pumps and chemicals. Typically pumps are supplied with no charge upon an annual chemical supply contract. Most state and local codes require a Class II Condensate Hood above high temp dish machines to exhaust the steam produced during the cycles. After you’ve made your purchase, you’ll need to contact a licensed plumber to install the water and drain lines as well as a HVAC contractor to install the vent duct, condensate hood, fan curb and exhaust fan. Type 304 stainless steel base legs, cross braces, front and side panels for durability and corrosion resistance. A stainless steel ¾ horse power water pump housed in the lower frame for the fill and dump cycle and a removable perforated stainless steel strainer for residual food by products. Removable stainless steel rack slides and stainless steel upper and lower wash rinse arms. These arms are interchangeable and are easily removable without the use of tools. Spring assisted doors that lift simultaneously. Easy field conversion from straight pass through to corner style. A couple of final shopping notes: Door type dish machines require a dish table or soil table with a scrap sink for pre-rinsing utensils, as well as clean tables for utensils exiting the machine. Make sure you measure your warewashing area to ensure you’re purchasing the proper size. Finally, door type dish machines do not feature a cord and plug. You will need a licensed electrician to hard wire the dish machine to the buildings power source. The use of lead in drinking water pipes has been restricted since the 1920s but in a few short months a new law will be in effect for restaurants, bars, and other foodservice establishments. If you haven’t considered the impact of these new regulations on your business, there is no better time than September’s “National Food Safety Month” to prepare yourself and your patrons. For several decades, scientists have warned about the exposure to lead and its effect on health. While concentrations of lead in drinking water are not typically derived from natural sources, one of the most common causes of lead concentration in water is contamination from the corrosion of water supply pipes and plumbing fixtures. As a result, the United States began restricting lead use in water pipes due to public health concerns. 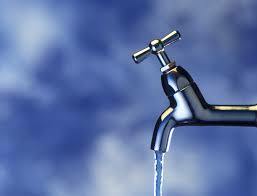 In 1974, The Safe Drinking Water Act (SDWA) was passed to regulate the nation’s public drinking water supply. As originally implemented, the SDWA required public water systems to minimize lead concentrations by controlling the corrosion that resulted in lead leaching from water system infrastructure. This could be achieved via careful management of the water’s mineral content, acidity, temperature, and proper maintenance and replacement of a water system’s piping. However, these actions did little to remedy the original source of the lead found in drinking water. Since the signing of the initial act, there have been several amendments. This includes a1986 amendment that mandated that all pipes, solders, pipe fittings, and plumbing fixtures used in the installation or repair of any public water system, or any residential or nonresidential facility that provides water for human consumption be lead free. By August of 2001, plumbing fittings and fixtures were limited to no more than 4.0% lead. Most recently, the Reduction of Lead in Drinking Water Act signed by President Obama on January 4, 2011, reduces the amount of lead permissible in water meters to 0.25%. These new regulations will go into effect on January 4, 2014. With a little over three months before federal regulatory requirements come into effect, many foodservice establishments are already converting to no-lead products to ensure proper inventory for 2014. Please note: if you’re located in California, Vermont or Maryland, your states have already passed comparable laws limiting lead content. While replacing pipes and outfitting for new regulations is certainly an expense and may even require some serious renovation work, it is important not to overlook your plumbing fixtures. Regulations require that both plumbing and plumbing fixtures meet the new lead-free requirements. This includes updating old faucets and pre-rinse assemblies that do not meet the updated maximums. Taking these steps will help ensure uninterrupted customer service and contribute to the health and well-being of your guests. A few years ago, I worked as a server at a local Max & Erma’s during a summer home from college. The best part of that job? Working doubles on Saturdays. Yeah, I actually mean that. On Saturdays, I would get a short break to eat between shifts. I always – always – bought a breadstick with my meal. As a college kid not concerned with carb intake, those warm, buttery breadsticks were heaven. I know now that those breadsticks kept their perfect consistency because of the built in drawer warmer in the kitchen. Below, I’ve taken a deeper dive into those drawer warmers with a brief overview and things to think about if you’re in the market. Drawer warmers are located in the back of house and are used in a variety of restaurants and fast food chains. Drawer warmers hold cooked foods, such as breadsticks, rolls, and baked potatoes, at the correct moisture level and holding temperature until they’re ready to be served. There are two primary types of drawer warmers: free-standing units and built-in units. Free standing warmers are the most popular due to their versatile application and their ability to be incorporated into almost any existing kitchen design. Free standing drawer warmers can be located on countertops, lower table shelves or on the floor next to the food prep line. Free standing drawer warmers are available in one drawer, two drawer, three drawer, and four drawer configurations. Additionally, optional casters are available instead of legs if you’d like your unit to be mobile. Built in drawer warmers are custom applications and are favored by restaurant design consultants because they are conveniently installed within stainless steel enclosed bases or custom workspaces. Built in drawer warmers are available in one drawer, two drawer, and three drawer configurations. Also, they often have digital controls versus manual controls like free-standing units. Standard features on both units include individual temperature controls, moisture controls, and a duel temperature gauge. Temperature controls the range from 100 degrees to 200 degrees Fahrenheit. 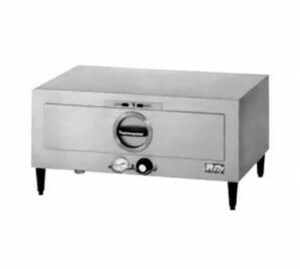 Drawer warmers have stainless steel fronts, sides, and drawer facings, while each drawer features a telescoping track and a full size (12” x 20”) stainless steel pan insert. Drawer warmers are available in 120 volt, 208 volt, 230 volt and 240 volt options. When shopping, make sure you verify the voltage capacity within your workspace, as well as the voltage on the unit with the manufacturer. Undercounter Refrigerators and freezers are a great addition to any front or back-of-house food prep area due to their versatility of design. Below, we’ve provided a brief overview on the variety of worktops and models available to the foodservice industry. 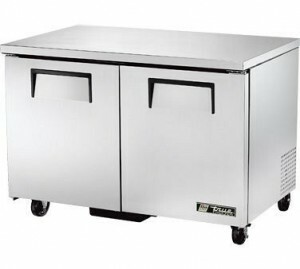 Undercounter refrigerators and freezers provide a sanitary work surface for food prep as well as a convenient refrigerated base to aide efficiency in your foodservice establishment. Typical undercounter refrigerators and freezers have a 35 ½ inch working height. Worktop units come standard with a 4 inch back splash. In addition, custom applications are available on standard flat top design units that do not feature a back splash. Undercounter units are available in a variety of sizes and widths. When you’re ordering your new or used undercounter refrigerator or freezer, make sure you first verify and then specify your counter height. Low profile casters are available to ensure counter height clearance. Single door units are available in a range of sizes, including 27 inches wide, 36 inches wide, and 48 inches wide. If you prefer a two-door under counter refrigerator or freezer, a 60 inch wide unit is available; as well as a three-door 72 inch unit.